The “Higher Planning Committee” of the Civil Administration office, the executive branch of Israel’s illegal military occupation, has approved the construction of 1550 units in a number of colonies in the occupied West Bank. Israeli sources said the committee approved the new construction plan, Tuesday, in colonies in several parts of the occupied West Bank. The new plan aims at building 1100 units in the West Bank, in addition to advancing plans for an additional 450 units. The sources added that an approval includes 150 new units in colonies in Hebron, in the southern part of the West Bank, 300 in Givat Ze’ev colony north of Jerusalem, and 300 in Nave Daniel and Karmie Tzur, in Gush Etzion colonialist bloc, south of Bethlehem. 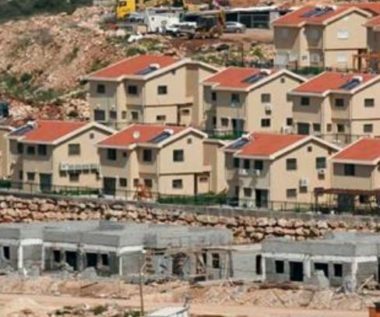 Israel also intends to deliberate for the approval of 129 units in Avnei Hefetz illegal colony, 121 in Yitzhar, 82 in Ofra, near Nablus, 55 units in Tzofim and 42 in Alfei Menashe, near Qalqilia in northern West Bank. Another plan will be discussed to build two Industrial Zones between Avnei Hefetz and Beit Illit, near Tulkarem, in northern West Bank. All of Israel’s colonies in the West Bank, including in and around occupied East Jerusalem, are illegal under International Law, the Fourth Geneva Convention and various international treaties. The Palestinians continue to lose their lands for the illegal constructions, in addition to the Annexation Wall which isolated large areas of orchards and lands, across the West Bank.